According to the user-generated online encyclopedia--Wikipedia, "Chatroulette is a website that pairs random strangers for webcam-based conversations. Visitors to the website randomly begin an online chat (video, audio and text) with another visitor. At any point, either user may leave the current chat by initiating another random connection." According to its founder, Andrey Ternovskiy, the site has about 1.5 million users. My work is concerned with learning and understanding empathy. Chatroulette's confounding popularity seems to be rooted in a simultaneous fear of contact and a desperately Postmodern desire to connect. Here I explore the coldness of an anonymous, often sexual, on-screen encounter with the profoundly humanizing experience of sharing a meal (albeit electronically). 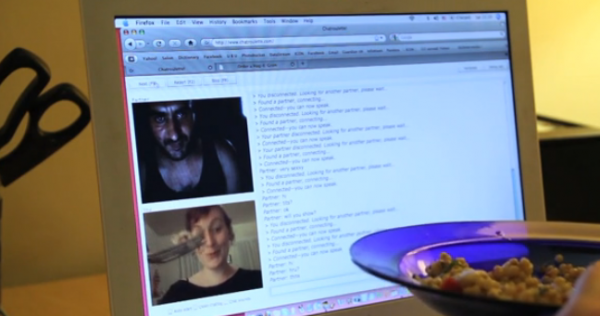 From March 2--May 2, 2010, I tried to share the first ten bites of my dinner with fellow Chatroulette users every night. The resulting object is a single channel video installation. Video available here.